The week’s two biggest television premieres arrive with plenty of baggage. Sunday marks the delayed opening of HBO’s Westworld, a sign that you can’t stop progress, no matter how many objections you have to a legal waiver involving genital-to-genital contact. 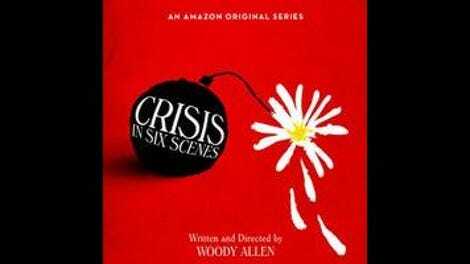 Two days prior, Amazon will introduce Crisis In Six Scenes, the Woody Allen miniseries whose announcement inconveniently coincided with resurfacing allegations that the filmmaker had sexually abused adopted daughter Dylan Farrow as a child. On top of that controversy, Allen copped to struggling with the process of making Crisis In Six Scenes. “I have regretted every second since I said okay,” he said in a 2015 interview with Deadline, following up to assure people that, for once, he wasn’t being self-deprecating for comedic purposes. In at least one of these cases, the results are more James Cameron’s Titanic than White Star Line’s Titanic: There are no regrets involved in buying a ticket to Westworld. As for Crisis In Six Scenes, it’s not a total disaster, but it does embody a crisis all its own. In press materials for the series, Allen stresses that Crisis In Six Scenes is a “light comedy,” and it meets those modest ambitions. For better and worse, the Vietnam-era story of a suburban household upended by the arrival of a radical activist calls to mind various entries in the Woody Allen back catalog, from Take The Money And Run to Don’t Drink The Water to Small Time Crooks. But what the series fails to do, especially in its logy middle passages, is argue why this was the right story for Allen to tell in this particular format. Some skillfully deployed, binge-enabling cliff-hangers notwithstanding, there’s not much here to differentiate Crisis In Six Scenes from any other late-period Allen trifle, slurped down in under 90 minutes and forgotten until the next round of cryptic casting announcements. Allen plays Sidney J. Munsinger, an aspiring novelist whose most significant cultural contributions are the advertising campaigns for a series of increasingly ludicrous-sounding consumer goods. (Recollections of Sid’s ads are the series’ most reliable gag; they’re sorely missed in later episodes.) The J.D. Salinger wannabe who pretentiously refers to himself as “S.J.” shares a well-appointed Connecticut home with his psychologist wife, Kay (Elaine May), and Alan (John Magaro), the college-age son of a close friend. This status quo is disrupted by wanted fugitive Lennie Dale (Miley Cyrus), a bomb-making enemy of the status quo who’s Patty Hearst without the brainwashing. The squares-versus-longhairs culture clash is positioned as the comedic ballast of Crisis In Six Scenes, but more than half the series is over before things start to go “boom.” Otherwise, the conflicts are as hackneyed as something out of the sitcom idea Sid keeps in his back pocket. Part of this is on the material, and part of it is on a miscast Cyrus. Straining for naturalism against her Hannah Montana-ingrained staginess, she fails to establish a consistent tone for Lennie’s fiery convictions—or the sensitivity that informs them. As a whole, Crisis In Six Scenes doesn’t know what Lennie is supposed to be: The character’s dialogue is so Revolutionary 101—all “oligarchy” this and “plutocrat” that—and Cyrus’ grasp on it so shaky, that at times it seems like Lennie is supposed to read as parody, a middle-class kid who took up a cause she doesn’t completely understand or truly believe in. That would be keeping with the overall flavor of Crisis In Six Scenes, which is stuffed with broad, farcical stuff like book-club blue-hairs quoting Marx or Sid trying (and failing) to retrieve a cash-lined briefcase without revealing the nature of its contents. But the way the series is filmed—Cyrus frequently delivers her lines in close-up, whereas Allen and May flit and banter through master shot after master shot—suggests otherwise. She’s as in over her head as Allen was when he took his Amazon deal. Watching Sid and Lennie jab each other over mooched fruit and extravagant kitchen appliances is dire, but at least it doesn’t drag like the mid-series sequences of Sid kvetching about the hippie to other people. This sort of thing should be the bread and butter of a Woody Allen TV comedy, but it can only hit those marks at the very beginning, during a chatty appointment between Sid and his barber (Max Casella). Crisis In Six Scenes is far better when the farce starts to unravel, shifting into caper mode for an eventful trip to Brooklyn or piling on the unexpected guests in the finale. Not coincidentally, these entertaining chapters are the ones that limit their Cyrus intake. Crisis In Six Scenes isn’t a statement piece, but it does find motivation in its characters waking up to the fact that they talk the talk, but don’t walk the walk. Lennie is full of sound and fury, but she’s also done things (all off screen) to signify something of a commitment to change. The character is well-conceived but poorly executed, a symptom of a formally sound work that nevertheless rings hollow. It bears the mark of an accomplished, prolific artist, but that mark doesn’t instantly elevate the series above any other piece of television. During a time when Woody Allen’s influence is so keenly felt in every auteur-driven or semi-autobiographical TV comedy that comes along—including the three others that had Amazon premieres this September—it’s a shame that Crisis In Six Scenes barely ranks among the most minor of works in that field. But as the man himself once joked, by way of Marx (Groucho, that is—or was it Freud? ): “I would never want to belong to any club that would have someone like me for a member.” Joining the television club was a trial for Allen, but turning down the invitation to Crisis In Six Scenes is easy. Reviews by Jesse Hassenger will run every other day beginning September 30.